Dubai: Bangladesh overpowered five-time champions Sri Lanka by 137 runs to provide a dramatic opening to the 14th edition of the Unimoni Asia Cup at the Dubai International stadium. The action began with the packed stadium witnessing one of the world’s finest pacers, Lasith Malinga, taking two wickets in the first over for Sri Lanka. This was followed by a fighting 131 runs partnership between Bangladesh’s Mushfiqur Rahim and Mohammad Mithun in 23.3 overs. Rahim enthralled everyone with a magnificent knock of 144 runs off 150 balls studded with eleven boundaries and four sixes to help Bangladesh post an impressive total of 261 off 49.3 overs. Malinga’s spell of 4 for 23 went in vain. Chasing the total, Bangladesh wrecked Sri Lankan innings and bowled them out for 124 runs in 35.2 overs. It was nothing but appalling batting with none of the Sri Lankan batsmen showing the determination to pull their team out of trouble like Bangladesh did to overcome their bad start. They lost their first three wickets for 32 runs. Opener Kusal Mendis and Dhananjaya de Silva fell for ducks while Kusal Perera and opener Upul Taranga could manage only 11 and 27 runs respectively. In the first ten overs they were tottering at 42 for 4. 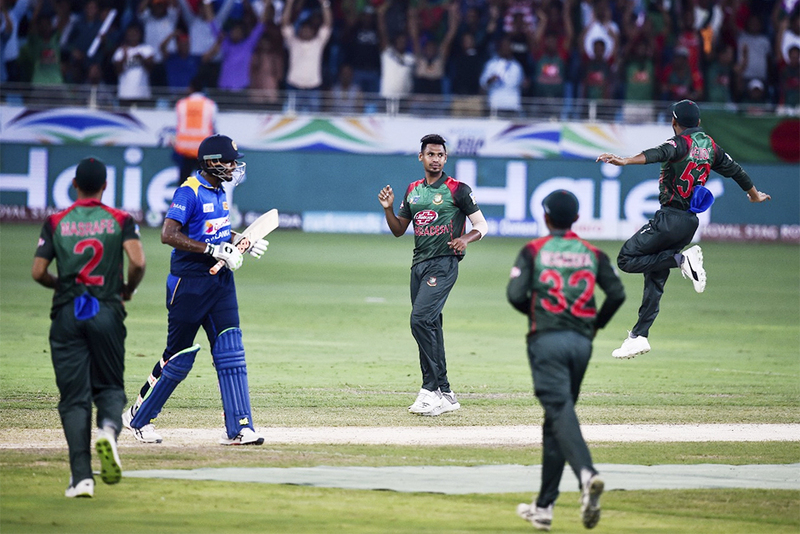 It would have been 57 for 5 had Bangladesh fielders Nazmul Hossain, substituting for Tamim, and his skipper Mashrafe Mortaza not misjudged a top edge from Dasun Shanaka and watch the ball drop in front of them. However three runs later, Shanaka got run out for 7. With half the side back in the pavilion for 60 runs in 16.1 overs and when skipper Angelo Mathews too followed falling leg before to Rubel Hosssain for 16, Bangladesh took complete control over the match. The Sri Lankan fans had come wanting to see Malinga , who once used to wreck batting line-ups in a flash but hadn’t played for Sri Lanka for close to one year, produce his deadly spell again. With the fifth ball of this first over, Malinga had opener Liton Das caught at slip with a ball that he made to move beautifully to get his outside edge. With the next ball Malinga had Bangladesh’s star batsman Shakib Al Hasan clean bowl with a delivery that swung in and sneaked through his bat and pad to hit his off stump. In the second over, opener Tamim Iqbal was hit on the wrist by pacer Suranga Lakmal delivery and had to retire hurt. Bangladesh would have been 6 for 3 had Sri Lankan skipper Mathews not dropped Mithun on one at mid-wicket off Malinga. Rahim too got dropped at his score on 10 by Dilruwan Perera at square leg off Thisara Perera. These two batsmen made full use of the drop catches and lifted Bangladesh out of trouble. They put on a 50 runs partnership in 12 overs and dominated the bowling . Mithun went on to complete his half century in 52 balls and steer Sri Lanka past the 100 run mark. Rahim too completed his half century in 67 balls. Malinga ended the stubborn partnership in the 26th over forcing Mithun to top edge his delivery. Mithun’s innings of 63 off 68 balls contained five boundaries and two sixes. Next man Mohammad Mahmudullah lasted only one ball playing a slog sweep to left-arm spinner Amila Aponso and getting caught. Malinga got his fourth wicket when Mosaddek Hossain’s attempted pull shot ended up hitting his glove. When Lakmal had Mehidy Hasan caught and bowled for 15, Bangladesh slipped to 175 for 6. Rahim then carried the innings with help from his skipper Mashrafe Mortaza (11). After Mustafizur Raham fell, an injured Iqbal came out to bat despite a fracture wrist. He had made a hole in his glove to cover the taped hand and gave support to Rahim who was in full flow. They put on 32 runs in 2.4 overs before Rahim fell to Perera.